General market and industry conditions can make it easier or harder to source new sales candidates. When the overall job market is tight (more jobs than applicants), it is harder to source strong candidates. In the tighter job market, you need to hire as soon as possible. The best candidates are gone quickly when the hiring market is hot. Even in a tight market, you still need an effective hiring process. If you short-circuit the process to put bodies in open positions, you risk hiring poor performers. Adding poor sales performers to your sales team can waste time/money and potentially damage your reputation in the marketplace. The infographic below shows how to implement an effective hiring process in a tight market or when you need to recruit passive job seekers. No matter the market, you will face times when you will be recruiting “active” vs. “passive” sales job seekers. When the overall job market is soft (more applicants than jobs), it is easier to source strong sales candidates. 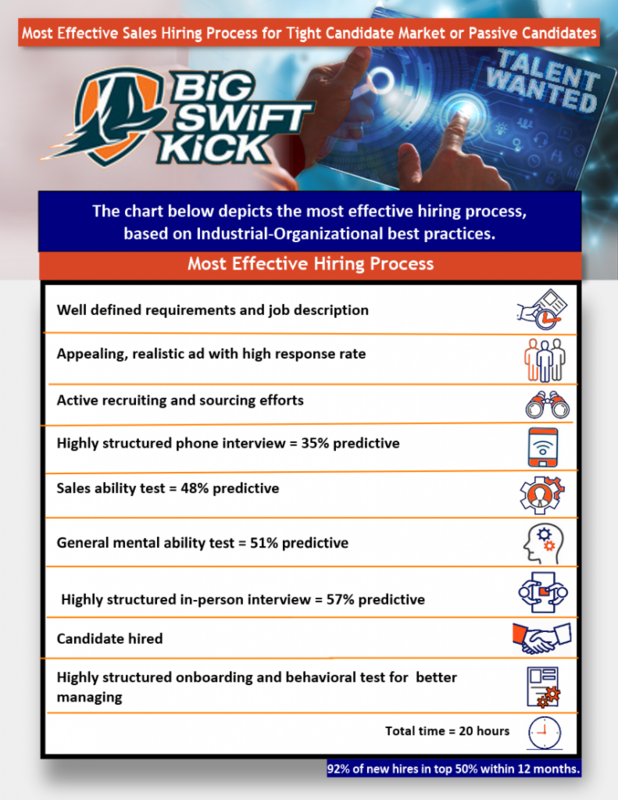 View this infographic, to see the best hiring process in a soft-to-normal job market.